Starting with SAP HANA 2.0 we can now partition a single table between in-memory storage and SAP HANA Extended Storage (AKA.. Dynamic Tiring). This is an excellent feature because it simplifies the management and code required to manage multiple tables and subsequently bridge them together using additional code. Basically, we can establishing archiving within our tables without the need to move the data into separate tables. Prior to SAP HANA 2.0, we would have to create two identical tables. One would be provisioned in-memory and the other in extended storage. We then had to create catalog views or SAP HANA Information Views to logically merge the tables together. With HANA 2.0 we no longer have to do this. Some Background Info for the example. I am creating a range partition on the column “ORDERYEAR”. Some partitions will exists in-memory, others will exist within extended storage. The “ORDERYEAR” Column is part of the primary key set. Extended Storage is enabled in the cluster. Adding filters to the query, that directly reference the partition column, seam to aid in the execution. For example, filtering on our partitioning column “ORDERYEAR” changes the execution and the UNION ALL is not executed. This means the optimizer is smart enough to remove the “Materialized Union All” from the execution because the query did not directly ask for data within the partitions hosted in extended storage. If the query does not perform a filter on the column used for the partition, the execution plan will look in extended storage and perform the UNION ALL operation. However, in my example below, the filter finds no matching data within extended storage and moves zero (0) records from the extended storage store into the “Materialized Union All” execution node. Because no data was moved from extended storage and into the “Materialized Union All” node, the execution was slightly faster than the first example. Given the amount of time it required to find this SQL for this new option within the documentation, I thought I would share a few example SQL statements I used with a test table. The first three SQL statements, creates a partition and then move partitions in and out of extended storage. I also included a CREATE TABLE statement to see how this would be accomplished from scratch. For Existing Tables we need to start by creating a normal range partition. With the release of SAP BusinessObjects 4.2 SP2, SAP has introduced a treasure trove of new enhancements. It contains a proverbial wish list of enhancements that have been desired for years. Much to my delight, SAP Web Intelligence has received several significant enhancements. Particularly in terms of its integration with SAP HANA. However, there were also enhancement to the platform itself. For example, there is now a recycling bin. Once enabled, user can accidentally delete a file and the administrator can save the day and recover the file. Note that there is a time limit or a configured number of days before the file is permanently deleted. Let’s take a more detailed look at my top 11 list of new features. This is the starting point for something that I have always desired to see in Web Intelligence. For many years I have wanted a way to define a central report variable repository. While it’s not quite implemented the way I desired, within the shared elements feature, the end results is much the same. Hopefully they will take this a step further in the future but I can live with shared elements for now. With that said, developers now have the option to publish report elements to a central located platform public folder. They can also refresh or re-sync these elements using the new shared elements panel within Webi. While this might not seem like an earth shattering enhancement, let’s take a moment to discuss how this works and one way we can use it to our advantage. Take for example, a report table. Within that report table I have assigned a few key dimensions and measures. I have also assigned 5 report variables. These variables contain advanced calculations that are critical to the organization. When I publish this table to a shared elements folder, the table, dimensions, measures and variables are all published. That’s right, the variables are published too. Later on I can import this shared element into another report and all of the dimensions, measures and variables are also imported with the table. One important functionality note is that Web Intelligence will add a new query to support the shared elements containing universe objects. It does not add the required dimensions and measures to any existing query. This might complicate matters if you are only attempting to retrieve the variables. However, you can manually update your variable to support existing queries. If you have not had the epiphany yet, let me help you out. As a best practice, we strive to maintain critical business logic in a central repository. This is one of many ways that we can achieve a single version of the truth. For the first time, we now have the ability to store Web Intelligence elements (including variables) in a central repository. Arguably, I still think it would be better to store variables within the Universe. However, shared elements are a good start. Assuming that developers can communicate and coordinate the use of shared elements, reports can now be increasingly more consistent throughout the organization. I don’t want to underscore the other great benefits of shared elements. Variables are not the only benefit. Outside of variable, this is also an exceptional way for organization to implement a central repository of analytics. This means user can quickly import frequently utilized logos, charts and visualizations into their reports. Because the elements have all their constituent dependencies included, user will find this as an excellent way to simplify their self-service needs. I find it most fascinating in terms of charts or visual analytics. For the casual user they don’t need to focus on defining the queries, formats, and elements of the chart. They can simply import someone else’s work. I was quite pleasantly surprised that this enhancement was delivered in 4.2. In the past, Web Intelligence would execute each query defined in a report in serial. If there were four queries and each required 20 seconds to execute, the user would have to wait 4 x 20 seconds or 80 seconds for the results. When queries are executed in parallel, users only have to wait for the longest running query to complete. In my previous example, that means that report will refresh in 20 seconds not 80 seconds. Keep in mind that you can disabled this feature. This is something you might have to do if your database can not handle the extra concurrent workload. You can also increase or decrease the number of parallel queries to optimize your environment as needed. Maps in Web Intelligence? Yes really, maps in Web Intelligence are no longer reserved for the mobile application. You can now create or view them in Web Intelligence desktop, browser or mobile. The feature also include a geo encoder engine. This engine allows you to geocode any city, state, country dimension within your existing dataset. Simply right click a dimension in the “Available Objects” panel to “Edit as Geography” A wizard will appear to help you geo encode the object. Note that the engine runs within an adaptive processing server and the feature will not work unless this service is running. I found this true even when using the desktop version of Web Intelligence. Web Intelligence – Direct access to HANA views. For those that did not like the idea of creating a Universe for each SAP HANA information view, 4.2 now allows the report developer to directly access a SAP HANA information view without the need to first create a universe. From what I can decipher, this option simply generates a universe on the fly. However, it appears that metadata matters. The naming of objects is based on the label column names defined within SAP HANA. If you don’t have the label columns nicely defined, your available objects panel will look quite disorganized. In addition, objects are not organized into folders based on the attribute view or other shared object semantics. With that said, there is an option to organize dimension objects based on hierarchies defined in the HANA semantics. However, measures seem to be absent from this view in Web Intelligence (relational connections) which makes me scratch my head a little. Overall, I think it’s a great option but still just an option. If you want complete control over the semantics or how they will be presented within Web Intelligence, you still need to define a Universe. Let me start by saying this, “this is not the same as direct access to HANA views”. While the workflow might appear to be similar, there is a profound difference in how the data is processed in SAP HANA online. For starters, the core data in this mode remains on HANA. Only the results of your visualization or table are actually transferred. In addition, report side filters appear to get pushed to SAP HANA. In other modes of connecting to HANA, only query level filters are pushed down. In summary, this option provides a self-service centered option that pushes many of the Web Intelligence data process features down to HANA. As I discovered, there are some disadvantages to this option as well. Because we are not using the Web Intelligence data provider (micro cube) to store the data, calculation context functions are not supported. The same is true of any function that leverages the very mature and capable Web Intelligence reporting engine. Also, the semantics are once again an issue. For some reasons, the HANA team and Web Intelligence team can’t work together to properly display the Information view semantics in the available objects panel. Ironically, the semantics functionality was actually better in the 4.2 SP1 version than in the GA 4.2 SP2 release. In 4.1 SP1, the objects would be organized by attribute view (Same for Star Join calculation views). Webi would generate a folder for each attribute view and organize each column into the parent folder. In 4.2 SP2 we are back to a flat list of objects. In your model has a lot of objects, it will be hard to find them without searching. I’m not sure what’s going on with this, but they need to make improvements. For large models, there is no reason to present a flat list of objects. Regardless of these few in number disadvantages, this is a really great feature. It truly has more advantages than disadvantages. User gain many of the formatting advantages of Webi while also leveraging the data scalability features of SAP HANA. As an added bonus, the report side filters and many other operations are pushed down to SAP HANA which makes reporting simple. User do not have to focus so intently on optimizing performance with prompts and input parameters. As proof that users know best, SAP relented and we can now define a Universe against a BEx query. No Java Connector or Data Federator required. This option uses the BICS Connection which offers the best performance. To me this all boils down to the need for better semantics integration. The same is also true of SAP HANA models. Having the ability to define a UNX universe on BEX queries has a lot to do with the presentation and organization of objects. For some strange reason users really care about the visual aspects of BI tools (and yes that last statement was sarcasm). One of the more frustrating aspects of the platform over the last few decades was the inability to easily recover accidentally deleted items. In the past, such a recovery required 3rd party software or a side car restore of the environment. If you didn’t have 3rd party software or a backup, that deleted object was gone forever. Once enabled, the Recycle Bin will allow administrators to recover deleted objects for a configurable amount of time. For example, we can choose to hold on to objects for 60 days. Only public folder content is support as well and user’s cannot recover objects without administrator help. However, this is a great first step and a feature that has been needed for over a decade. Well it only took a few years but we can finally selectively import objects contained in an LCMBIAR file within the promotion management web application. Ironically I really wanted this functionality a few years ago to help with backups. Specifically public folder backup to aid users that accidentally deleted objects. Now that SAP designed the recycle bin, there is less of a need for this solution. Prior to the latest enhancement, you had to import all objects in an LCMBIAR file. If I only wanted 1 of 8000 objects in the file, I had to import it into a dedicated temporary environment and then promote just the needed objects into the final environment. Using the installation command line, administrators can now prepare the system for installation without down time. It does this by performing all of the binary caching and some of the SQL lite installation database operations before it invokes the section of the install that require down time. Running setup.exe –cache will invoke the caching portions of the install. When ready to complete the install, running setup.exe –resume_after_cache will complete the insulation. In theory, the later portion of the installation step reduces the down time by eliminating the dependency between the two major installation and upgrade tasks. In large clustered environment this is a great addition. In all types of environments this is a great enhancement. Previously the system down time was subjected to the long and tedious process of caching deployment units. After you upgrade to 4.2 SP2, you will need to obtain a new license keys. The keys that once worked for 4.0 and 4.1 will not work after upgrading to 4.2 SP2. The graphical installer will also let you know this. Be prepared to logon to service market place and request new keys. I only mentioned what I thought to be the most interesting new features. However there are several other features including in 4.2 SP2. The following links contain more information about the new features in SAP BOBJ 4.2 SP2. When you design an SAP HANA information view, we must also define joins between tables or attribute views. 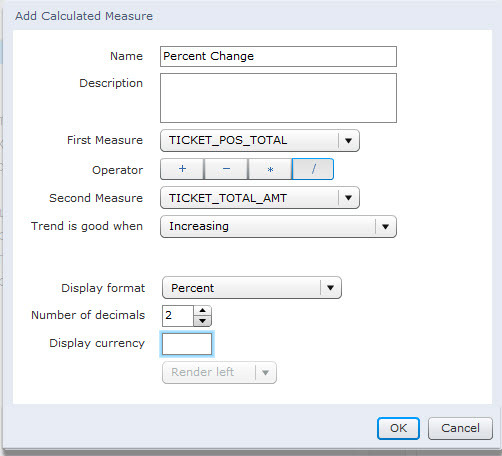 These joins can be configured in the foundation of attribute views and analytic views. They can also logically occur in analytic and calculation views. In some cases, joining tables can be an expensive process in the SAP HANA engines. This is especially true when the cardinality between tables is very high. For example, an order header table with 20 million rows is joined to an order line detail table with 100 million rows. Excessive joining in the model is also something that can lead to performance issues. Excessive joining is something that occurs often when we are attempting to denormalized OLTP data using SAP HANA’s information views. What is the solution to work around join cost? Join pruning is a process where SAP HANA eliminates both tables and joins from its execution plan based how the joins are defined in the information view and how data is queried from the information view. For example, let’s assume that we have a customer table or attribute view configured with a left outer join to a sales transaction table in our analytic view. If we query the information view and only select a SUM(SALES_AMOUNT) with no GROUP BY or WHERE clause, then the execution plan might skip the join process between the customer table and the sales transaction table. However, if we execute SELECT CUSTOMER_NAME, SUM(SALES_AMOUNT) then the join between the customer table and sales transaction will be required regardless of the join type used. The process is subjective and related to how the joins are configured in our information view. It is also subjective to how the information view is queried. If every query we execute selects all attribute and measures, then join pruning would never be invoked. Fortunately, in the real world, this is not typically the case. 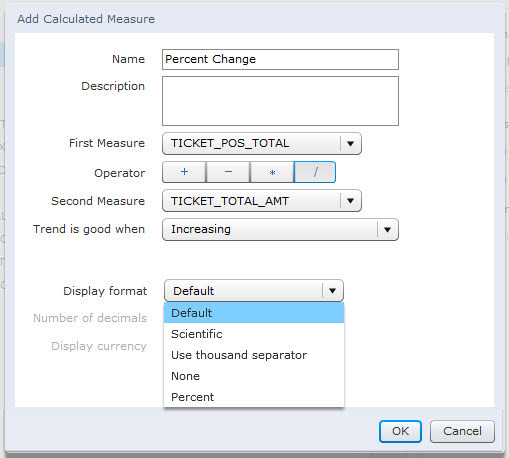 Most queries only select a subset of data from the information view. For this reasons, we should try to design our information views to take advantage of join pruning. What join options do I have? There are five main types of joins to look at in this context. Inner Joins, Referential Joins, Left Outer, Right Outer and Text Joins. Below is an outline on how SAP HANA handles each join type. Inner Joins are always evaluated in the model. No join pruning occurs because an inner join effectively tells the SAP HANA engine to always join no matter what query is executed. Records are only returned when a matching value is found in both tables. Overall they are one of the most expensive join types that can be defined in an information view. They also have the potential to remove records from the results assuming that referential integrity is poorly maintained in the source tables. For all intents and purposes, the referential join acts like an inner join. However, under specific circumstances, the referential join will be pruned from the execution of the information view. Assuming that there are no filters defined in an attribute view’s foundation, the SAP HANA engines will likely prune the join from the execution plan of the analytic view. This assumes that no columns are queried within the same attribute view. However, if a column from the attribute view is included in a query, this join will act as an inner join. Let me reiterate the exception to the pruning rule one more time. If filters are defined in the attribute view, the join will be included and enforced as an inner join even if no attribute view columns are selected. This means that records are only returned when a match is found in both the attribute view and analytic view foundation table. It also means that referential joins are not always pruned from the information view execution plan. Pay close attention to this exception because referential joins can be just as expensive as inner joins. Based on several query scenarios that I tested, the left outer join is always pruned from the execution plan assuming that no columns are selected from an attribute view defined within the model. Left outer joins are often defined in instances where the analytic view foundation table is known to have no matching record within an attribute view. By design, they prevent the model from excluding transactions. This is because it will ensure that all possible transactions are returned, even if we are missing master data. Overall I would say that the left outer join has the potential to be the best performing join within our information view definition. However, we have to make sure that it makes sense before we arbitrarily set up our models with left outer joins. We sometime need the inner join to help exclude records. For example, let’s assume that we have a date attribute view joined to a data column in our analytic view foundation table. Using an inner join we can exclude any transaction that has no defined date. There are other instances where we might find phantom transactions in our aggregates with a left outer join. For example, a transaction that has no customer, date or product. In those cases, something was likely only partially deleted from the system. Therefore, referential integrity issues can create problems.If you recall a similar issue can happen with referential joins. However, with left outer joins we will always return the transaction. The right outer join is used in instances where all attribute view values need to be returned even if they have no matching transactions. For example, I need a complete list of all customers even if they have never been issued an invoice. This would be helpful if the query were targeting both existing and potential customers. Keep in mind that a mismatched transaction will be excluded from any analytic view’s aggregates. Based on my testing, a right outer join is always performed in the execution of the model. I was not able to devise a single scenario where the join was pruned from the execution of the model. With this in mind, it will have a high cost when used in the information view definition. This is effectively an inner join setup specifically to work with the SPRAS field found in SAP BusinessSuite tables. Based on my brief testing, it is always executed and never pruned from the model. A few weeks ago SAP released SAP BusinessObjects 4.1 Support Pack 4 (SP4). This package introduced a few new features which are listed in the “What’s New guide”. It also introduced compatibility or support for s few new items. There is not much to talk about so ill keep in brief. The translation manager now supports Analysis for OLAP documents. You can now schedule BEx based Web Intelligence reports where the BEx query contains dynamic variables. If you are active in the SAP ecosphere and you have somehow managed to never see or hear anything about SAP HANA, I can only conclude the following. You obviously live under a rock in the deepest darkest forest on a planet in a distant galaxy where SAP has yet to establish a sales territory. All joking aside, it is very unlikely that SAP HANA has not been at the forefront of most SAP related discussion in recent years. For those that know about SAP HANA, I would bet that your first thought is always related to one word. That word is “fast”. SAP HANA is an in-memory, columnar store and massively parallel analytical data processing engine. For the average business intelligence (BI) consumer this conglomeration of adjectives and technical terms mean one thing; it’s fast. If we accept that SAP HANA is fast, we have to ask ourselves what do I gain with speed? We then have to ask is speed alone a primary reason to purchase SAP HANA? What do I gain with speed? Below I will list a few of the more obvious reasons that speed maters. There are other reasons not listed but this will help start the thinking process. It is very easy to argue that we are more productive when we spend less time waiting for software to respond. In the golden oldie days of BI, we would often endure a query that required 30 + minutes to execute. That was 30 minutes of time we had to do something else. I like to call these queries the “coffee break queries”. This is because we often use this time to go get coffee. If we can reduce these queries to seconds with SAP HANA, users will be more likely to stay engaged and remain productive. Speaking of 30 minute queries, can you imagine how unwilling a consumer would be to explore their data if every perspective change required a 30 minute wait time? My experience is that users quickly loose interest in exploring their data when the software is too slow to respond. If we could reduce these queries to seconds, users will be more likely to not only be productive but to also dig a little deeper into their data. Think of SAP BusinessObjects Explorer running on SAP HANA. Users can take a billion row dataset and explore it from multiple perspectives. Because of speed, we can now gain better depth into our data. When we think of speed, we often focus on the consumer’s experience. However, daily IT processes can also be accelerated with SAP HANA due to the increased data loading capabilities. If your legacy data load process required 14+ hours, most SAP HANA solutions will likely reduce that by more than 50%. This gives IT departments more time to recover from data load failures or to extend the scope of the data set. It also provides the data consumer with a greater chance that their data will be available the next day. As a general rule, if we can outthink and respond faster to a changing economic climate, we often gain a competitive edge over our competition. In some ways, SAP HANA can helps us do that. SAP HANA cannot think for us but it can help us discover trends, identify changes, understand our successes, identify our failures and accelerate other areas of our business. Most organizations can already do all of these things effectively with their current BI environments. However, imagine how much better it will be when it happens faster with larger and more complex datasets. Another competitive advantage for organizations is their ability to service their customers. Speed can help an organization better understand their customer by instantly analyzing past history and predicting future needs. This can be done quickly and on the fly when we have speed. With that advantage we can start embedding sophisticated analytics in our frontend applications. Take for example a call center. If we enter the customer’s details into a system, we can then have a series of analytics pop-up that help us understand the customer relationship to our organization. We can also suggest products and services they might be interested in based on these analytics. This is all achievable because of speed. Is speed alone the main reason for purchasing SAP HANA? Query and processing speeds alone are not the only reasons to purchase SAP HANA. There is more to SAP HANA than just speed. Speed allows an organization to achieve technical wonders but behind the speed is a process. There must be a process for obtaining data that is consistent, repeatable and reliable. For years we have known this as the Enterprise Information Management (EIM) process. Using processes and tools, organizations can obtain data, model it into usable structures and then load it into a database for querying. The process also helps other initiatives such as data governance, data quality and a “single version of the truth”. The down side to the processes is that obtaining new data is often seen as slow and cumbersome by the data consumers. They often have to wait weeks or months before data is available to them. This happens for a variety of reasons. IT resources often have to first find the data, develop a processes to capture it on a recurring basis and then deal with any gaps or inconsistencies. That is not necessarily a problem that can be overcome with any level of speed or technology. The hope is that these complexities subside after a strong data governance program is instituted. One where the organization begins to manage data as an asset as opposed to a byproduct. In short, only processes and management can fix part of the EIM problem. However, there is another side to EIM that has evolved around the needs of the data consumer. There is more to data than just storing it in a Kimball / Inman star schema of tables. Users have to be able to construct or access queries that can answer relevant business questions. If we solve these problem with the EIM process alone, we often end up with extra aggregate tables, custom fact tables or a variety of different tables formulated to help query processing. Unfortunately, these extra tables add more and more time to the recurring data update process. As the processing time and complexity of managing these processes increases, the data consumer becomes more and more impatient. With the traditional RDBMS, these extra tables are also sometimes required because of the inefficiencies of the row store and spinning disk. With SAP HANA, we can begin rethinking this strategy on all fronts. SAP HANA’s speed helps us reshape this strategy but there is more to this story than speed. Let’s not forget the SAP HANA also has something special built-in to its data platform. SAP HANA has multidimensional models built directly into the database. By name they are called attribute views, analytic views and calculation views. In a generic since, they act as a semantic layer. They are often called information views or information models. They act as a layer that exists between the database tables and the data consumers. They provide easy, consistent and controlled access to the data. In a traditional BI landscape, this semantic layer is typically separated from the RDBMS. However, with SAP HANA it is directly integrated. In some BI products, this layer acts as a separate data store. Take for example the traditional OLAP cube. OLAP cubes, using MOLAP storage, not only store the metadata but they also store the actual data. They act like a supercharged BI database but they require extra time to load. Then there are technologies such as the SAP BusinessObjects universe. It takes a ROLAP approach where data is kept in the database and only metadata is stored in the semantic layer. This cuts down on the data load times but the semantic layer interface is typically proprietary. This means its not universally possible for most BI tools to access the semantic layer. In most cases the same is true of the OLAP cube because not every BI tool has an interface to its data. The MOLAP and ROLAP methodologies both have multiple benefits which are beyond the scope of this posting. However, one thing is clear with the legacy semantic layer. It has traditionally been separated from the RDBMS and it often only works with a limited set of BI tools. SAP HANA is different, though. To understand how it is different lets answer a few questions. One, how does SAP HANA help the overall EIM process? 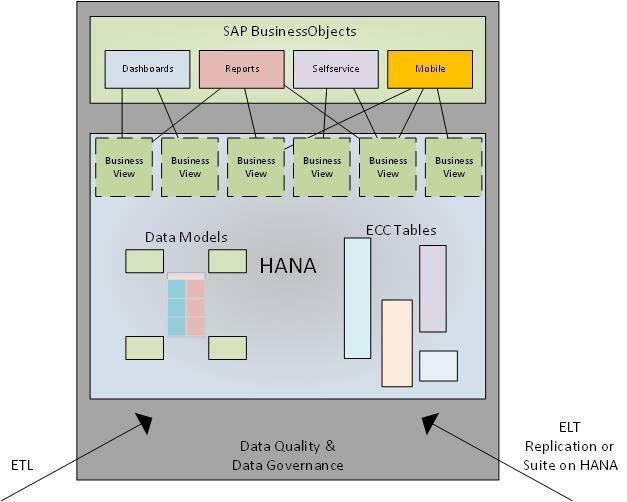 Two, how do we leverage the SAP HANA multidimensional information models to aid consumers? SAP HANA helps the overall EIM process by eliminating the need to create special use tables and pre-aggregate tables. With SAP HANA, these tables can be converted into logical information views and accessed with SQL. By eliminating these persistent tables, we are reducing the time required to execute the recurring data update process. These same information views also help IT to make changes faster. By reducing the number of physical tables in the model, IT developers are able to make changes without the need to also update data found in downstream tables. The basic idea is that logical information views are more agile than maintaining the equivalent physical table. If we assume that agility is an important benefit of SAP HANA, we must also consider relevancy. Getting content to the consumer quickly is part of the battle. We also have to make sure that the content is relevant. This means that we need to make sure that the content helps the consumer answer relevant questions. This is also an area where the information view helps the consumer. Developers can create custom logical models that contain relevant data attributes and measures. Because they are embedded into the RDBMS and centrally located, these views can also be accessed by any tool that supports the SAP HANA ODBC, JDBC or MDX drivers. This helps an organization to maintain a single version of the truth while simultaneously providing an agile and relevant foundation for the consumption of data. The above figure helps to illustrate this benefit. Starting at the bottom we wrap the entire process into the Data Quality and Data Governance umbrella. This means that these processes govern everything we do in SAP HANA. We then focus on how the data gets into SAP HANA tables. This can be a daily batch Extract Translate Load (ETL) processes with SAP Data Services or a daily delta load using the BW extractors into a BW on HANA instance. We also have to look at the Extract Load Translate (ELT) processes. This includes instances were SAP Landscape Transform (SLT), SAP Replication Services or SAP Event Stream Processor (ESP) is used to provision data, in real-time, into SAP HANA. As an added bonus we can also add BI solutions built into SAP Business Suite on HANA in this area. The provisioning solution that is used at this layer all depends on the data consumer’s requirements and the organization’s needs. However, the goal at the data provisioning layer is to minimize the amount of data duplication and eliminate the need for subsequent processing into additional tables. Data should be stored at its lowest level of granularity in either a normalized or denormalized fashion. Ideally it is only stored in a single location that can be reused in any information model. For example, this means we can focus on developing the base FACT and DIMENSION tables, DSOs or replicating normalized ECC tables. Anything that is required above this layer should be logical. This is not to say that we can facilitate all needs with logical models, but it should be the preferred methodology to facilitate an agile foundation. Above the physical table layer we also have what I am calling the “Business View” layer. This is the layer where we achieve two goals. One, we try to do the bulk of specialized transformations and calculations at this layer. The SAP HANA information views are logical and do not require the movement of data. This makes them agile when changes are required. Second, we try to construct views that facilitate the needs of the data consumer. By maintaining relevant views, data consumers will be satisfied productive decision makers. At the top of the diagram we have the SAP BusinessObjects BI tools. Ideally we would use SAP BusinessObjects but other 3rd party tools can also be considered. Regardless of the type of tool, SAP HANA information views should be the primary point of access. This is because they should contain all of the relevant transformations, security and calculations. Again, they are centralized which helps foster a single version of the truth throughout the organization. In summary, beyond speed there are two other fundamental benefits of SAP HANA. Agility and Relevancy are also benefits of SAP HANA. Regardless of the SAP HANA solution we choose, agility and relevancy can be leveraged. They might be implemented in slightly different ways but the goal should remain the same. As an added benefit we can also expect great performance (in other words “Speed” helps too). Many hardware vendors are on the verge or have already released their new certified SAP HANA servers based on the Intel Ivy Bridge v2 CPU and related chip sets. So what does this actually mean to the consumer? A faster RAM chip means faster query response time. The Ivy Bridge v2 CPU support DIMMS based on the DDR3-1066, 1333 or 1600 MHz architecture. The previous generation of servers only supported DDR3 memory clock speeds of 800, 978, 1066, 1333 or 1066. Faster clock speeds mean faster seek times. The net result is a faster SAP HANA system. A faster CPU clock also means faster query response times. The certified SAP HANA systems running the Ivy Bridge v2 CPU support clock speeds of 2.8 GHz with turbo speeds of 3.4 GHz. The previous generation of E7 CPU operated at 2.4 GHz with turbo speeds of 2.8 GHz. A faster clock means fewer wait cycles and a faster SAP HANA system. This allows hardware vendors to supply customers with a 4 sockets (60 core) server that supports 1TB of RAM. Unless something recently changed, SAP has always maintained that the ratio between RAM and CPU core needs to be around 16GB per Core for analytical solutions. The previous generation of 10 core CPUs could only achieve his with an 8 socket motherboard. Because Ivy Bridge V2 supports 15 cores per socket, vendors can now operate 4 socket SAP HANA systems that host 1 TB of RAM. In general this will help reduce the cost of the 1TB server. 8 socket chassis and motherboards are generally very expensive. A 4 socket alternative will likely be less expensive. For S0H (Suite on SAP HANA) the ratio is different. In general 32GB per core is supported. This means that a 4 socket (60 core) server can now host 2TB of RAM. This will also greatly reduce the cost of SAP HANA systems operating SoH. SAP claims that the overall benchmark yields a 2x increase in speed compared to the 1st generation of certified SAP HANA systems. However, I still think we need verify the performance as vendors try to support 1TB of RAM on the 4 socket architecture. If you think about it, the 1st generation 8 socket systems supported 80 cores. The new 4 socket Ivy Bridge v2 systems support 60 cores. Their is a CPU/RAM ratio difference of 80/60 to 12.8GB/17.1GB (1024 GB / 60 or 80). Perhaps the faster memory clock speeds and other enhancements to Ivy Bridge v2 easily overcome any issues? I guess we will need to wait until official benchmarks are available before passing judgement. Some vendors are able to build XS (Extra Small) through XL (Extra Large) SAP HANA systems on the same server chassis and motherboard platform. This will allow organizations to scale up or add RAM and CPU’s as needed. The previous generation of servers were based on a variety of platforms. Often organizations would have to purchase a new server when they needed to scale up. The logging partition appears to no longer require super fast PCIx Nand Flash cards? The first generation of SAP HANA servers were all equipped with Fusion IO cards or RAID 10 SSD arrays. The 2nd generation appears to have relaxed the IOPS requirements. If this is truly the case, the storage cost for SAP HANA servers should also be greatly reduced. The PCIx cards and SSD arrays are very expensive. If SAP HANA can operate its logging mechanism at optimal speeds, on a partition using more cost effective spinning disks, you should expect a less costly SAP HANA server. Note: SAP HANA stores and accesses date in RAM. The disks only contain redundant information in case of a power failure. The only conceivable downside to a slower logging partition, is a scenario where bulk loading large chunks of data to SAP HANA is slowed. It can also affect the SAP HANA startup time. When started, SAP HANA takes ROW data from disk and lazy loads COLUMNAR data as needed. If the anything needs to be recreated from the logs at startup, I would assume that a faster disk is better. The new question is, “how much better”? Note: I have an open question to SAP on why the logging partition no longer requires fast disks. Something must have changed?